Our office is a friendly, bustling place with an open concept feel. Dr. Green, Dr. Mohl, and the entire team at Green Chiropractic care about you and your health, and we can’t wait to see you here. 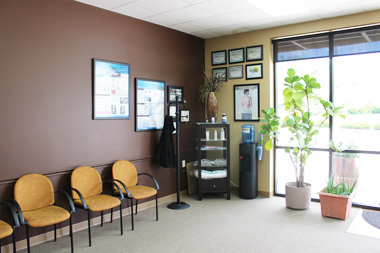 We hope you’ll look forward to your appointments with us and have fun while you’re at the practice! Welcome to our conveniently located office in Lincoln! Once you’ve decided chiropractic care is right for you, our doctors will thoroughly evaluate your condition before beginning treatment. Typically, your first visit will be dedicated to your consultation and examination, and you’ll be treated starting with your next appointment. You can download our new patient paperwork and complete it at home before coming in for your appointment. Doing so will save you some time while you’re here. If you don’t have a printer or need some help with the documents, we’ll be happy to help you with the paperwork here in the office. Your doctor will sit down with you to review your paperwork and listen carefully to your concerns. Together you’ll discuss what the problem is and how it’s affecting your life and daily activities. Finally, you’ll have a thorough examination and X-rays, if necessary. We take X-rays right here in our office, to save you the time and hassle of a referral. If you complete your paperwork at home, you should expect your appointment to last approximately 30 to 45 minutes. If you plan to complete your paperwork in the office, please allow a bit more time. When you return for your second visit, your doctor will have reviewed your examination findings and your X-rays. You’ll discuss your goals for your care, learn about your treatment options, and work together with your doctor to develop a plan for your care. We encourage you to ask questions, and we do our best to give you the answers you need to make informed health care decisions. A new patient spinal care class is offered every Monday evening, to help you jumpstart your care and ensure you get great results that last. You can also take advantage of our lifestyle wellness classes to learn more about living your life as fully as possible. You should feel empowered to improve your health, and we are here to help. Contact our office today to schedule your consultation and start living to your full potential!